Northern Newton County is filled with beautiful farm ground, gently rolling hills and dense forests. It makes the perfect backdrop for the Grand Kankakee Trail Riders&apos; two annual races, the Sand Booger Enduro and the Sand Goblin Enduro. Enduros are dirt bike races, but they&apos;re not the type you would see on ESPN. There&apos;s no race track and no stadium seating. There&apos;s no checkered flag at the finish line, and the first person to complete the race doesn&apos;t necessarily walk away with the biggest trophy. These exciting races are run through fields and woods, on roads, down ditches, over log piles and across skinny bridges. 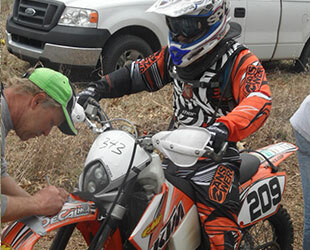 Riders have to stop at check points to have their time recorded both on their bike log and an official log sheet. The goal is for riders to get as close as possible to the set time for each section. Winners in each class are determined by how close they come to the overall race time. My daughter, Jenna, and I get a kick out of watching these races, so we headed out to check out the Sand Goblin Enduro. It was a gorgeous day - one of the first nice weekends of the year. We pulled into the parking area (aka cow pasture) and caught a whiff of burgers cooking on the grill. Lake Village firefighters come to the race every year to not only assist in case of an emergency, but also to have a fundraising cookout. We parked and headed out on foot to the start of the race. As we trekked down the sandy, tree-lined road, dirt bikes whizzed by us. When we got to the starting line, we were amazed at the amount of riders. 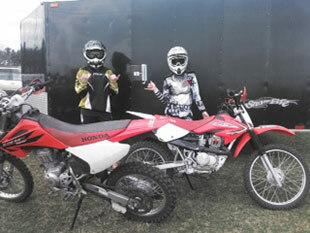 Mike Veld, president of GKTR, said that there were more than 400 riders from all over the Midwest participating in the two-day event. 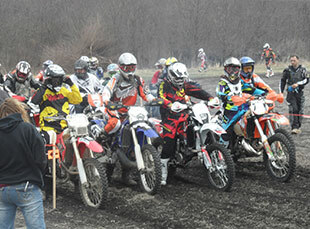 Instead of having one massive starting line, enduro racers start in groups of four or more, spaced several minutes apart. This keeps the riders from getting too bunched up along the route and allows the time keepers to run riders through check points more efficiently. Each year these races have a different obstacle thrown in to keep everyone on their toes. One year racers had to navigate their way through an old house that was about to be demolished. Riders could barely fit their handlebars through the doorways! Another year, the ditches were full of water and riders had to make it through the mucky water and up the steep, slippery slope on the other side. Quite a few racers got soaked that day! This year&apos;s challenge was the log section. Just about a mile into the race, riders were faced with logs; lots and lots of logs. Logs were lying flat on the ground, logs were stacked in a huge pile and logs were laid on angles to direct traffic. I could sense the frustration as riders got stuck, dumped their bikes or simply got caught behind a slower rider. I&apos;ll bet those racers went home sore and tired - but bragging about making it over the log section! Jenna and I headed back to the parking area to grab some lunch and a cold pop. We stopped at one of the check points to visit with our friends, Brian and his sister, Aimee, who were keeping track of the racers&apos; times. Brian&apos;s daughters, Nicole and Meg, had taken first place and second place respectively in their classes. Eighth-grader Nicole and sixth-grader Meg have been racing for a number of years – and have the trophies to prove it! We finished out our day by heading over to the bridge crossing. This section took riders through a wooded area, down a steep hill, across a small bridge and back up the embankment. 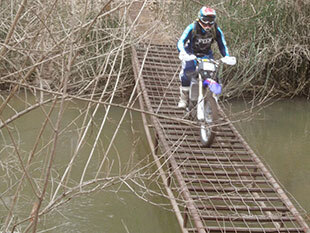 Thankfully none of the riders rode off the bridge – I&apos;m sure by that point they were exhausted! Jenna and I really enjoyed the race again this year. If you get the opportunity to watch one of these races, I&apos;d highly recommend it. It&apos;s fun to wander Newton County&apos;s rural farmlands and catch some exciting racing at the same time!